Tectonic shifts are rocking the power grid: Clean energy costs are plummeting. Technology is turning buildings into thermal batteries that can conserve power with the flip of a switch. New businesses are entering the power industry, shifting a historically monopolistic sector into a highly competitive age. A changing climate is making extreme weather more common, testing the resilience of critical infrastructure. Policymakers face the difficult task of balancing three must-haves for the power sector: affordability, reliability, and environmental performance. It’s a tall order to get this right—and getting it wrong gravely imperils the economy. Energy Innovation works with national and regional decision makers to develop policies that will manage the grid’s transition to a cleaner, lower-carbon resource mix. Our largest project in this realm is America’s Power Plan. Because every economic sector is touched by energy, it becomes all the more crucial that we get energy policy right. Trillions of dollars are invested in energy each year, meaning smart energy policies must be put in place if we want to avoid underperformance, overspending, or wasted time and resources for minimal results. Energy Policy Solutions helps determine the right policies that help us meet our climate goals at the lowest cost. The Energy Policy Simulator quantitatively measures the economic, environmental, and social impact of more than 50 policies, and finds that it only takes a handful of well-designed policies within each economic sector to get us to a low-carbon future. That said, even the most well-intentioned policies will not meet their desired objectives without smart policy design and implementation. Policies work best when they are price-finding, encourage new technology, include continuous improvement, and reward performance over investment. For years, California has been a world leader in climate action: It has established policies that improve efficiency in buildings and cars, increase the share of renewables on the electric grid, and charge the state’s largest polluters for their carbon emissions. All signs show these efforts are paying off—not just environmentally, but economically and socially as well. California’s experience exemplifies the opportunity all economies have to reduce greenhouse gas emissions while still achieving strong economic growth. But the state’s work isn’t done yet. California must continue to work toward statewide emissions reductions for many years to come—striving to meet its goals in 2030 and beyond. 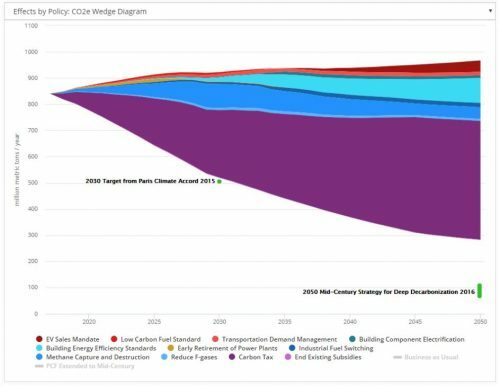 A suite of policy options—performance standards, extending the cap-and-trade program, and making zero- emission vehicles the rule instead of the exception—can ensure the state stays the course, continuing to provide a successful model at the leading edge of decarbonized prosperity. More than 1 million people move to cities every week, so the shape of urban areas and their transportation networks strongly affects global energy use and carbon emissions. Because cities last for centuries, decision makers must lock-in smart urban form, efficient transportation systems, and sustainable energy and resource management practices from the start. Well-designed cities are people-centered. They offer dense networks of streets and paths. They provide vibrant neighborhoods with diverse amenities and services. And they prioritize walking, biking, and public transit over driving private vehicles. The Green and Smart Urban Development Guidelines identify the most critical elements of urban form, transportation, and energy and resource management, and outline how advanced technologies can be used to optimize urban systems. By following these guidelines and learning from success stories around the world, the cities of the future can be vibrant, sustainable places where residents thrive.